Meredith Marin opens the fridge at the Ling & Sons grocery store to show seven chefs from the Manchebo Beach Resort her favorite brands of soy sausages, marinated jackfruit and plant-based milks. Today’s excursion is meant to educate and inspire them for their upcoming three-day hands-on kitchen training, where they’ll learn to make smoothie bowls, vegan mac ‘n’ cheese, vegan sushi and beach bar snacks, including vegan nachos with cashew cheese. Marin is the founder of Vegan Aruba, the go-to website and restaurant consultancy for vegan food on the island. A few years ago, when she moved to Aruba from New York, with her Aruban husband and young daughter, she found that eating vegan on Aruba was difficult. Hidden gems existed, like Eduardo’s Beach Shack, with its açai breakfast bowls, juices, poke bowls, gluten-free waffles, wraps, vegan lattes, energy balls and CocoWhip – an incredibly creamy vegan soft serve made with coconut water. But in general, restaurants didn’t know how to adapt and she ended up eating a lot of pasta. So she turned her frustration into an opportunity, which started with a presentation to the Aruba Gastronomic Association about what it was like to be a vegan guest. “I showed them pictures of my meals and explained how vegans feel left out. We can’t order off the menu like a regular client,” she said. The response was overwhelming. She says, “Everyone was really excited and asked, ‘Can you help us?’” She launched Vegan Aruba in October 2017. Now, she’s worked with more than 10 restaurants, from vegan menu consultation to her complete package: a grocery store field trip, multi-day recipe and menu development, server training and promotion, and menu launch support. That’s a trend he’s already seeing at Manchebo. More people are ordering lunchtime salad bowls and quinoa burgers at the resort’s Pega Pega Restaurant and roasted cauliflower steaks with polenta fries, truffle aïoli and organic herbs (from the on-site garden) at Ike’s Bistro. General Manager Menno Conijn of Taste of Belgium worked with Marin on the brunch menu, where flax seeds now replace eggs in the French toast and indulgent chocolate brownie cake, and a full vegan dinner menu is available. “She’s passionate and inspirational,” said Conijn. Food and Beverage Director Mark Giesbers of the Bucuti & Tara Beach Resort was amazed by what she taught his team to do with cashews, a nut that Marin uses for everything from creamy pasta sauces to desserts. The cashew cheese tacos with peppers, black beans, tomato salsa and chunky guacamole are now a bestseller on Elements’ vegan lunch menu. Marin’s ultimate menu creation, though, might be the vegan seafood platter at Fishes & More: watermelon “tuna,” smoked carrot “lox,” lychee ceviche, portobello “shrimp” tempura and Cajun tofu fillets served with brown rice, fried nori and spicy vegan mayo. “The watermelon is sautéed with teriyaki sauce with sesame seeds on top, but the texture and look is like eating ahi tuna,” she says. Thanks in part to her, many restaurants on the island now feature vegetarian, vegan, dairy-free and gluten-free items on their regular menus. Some have even launched full vegan dinner menus, including Cuba’s Cookin’, Fishes & More, Elements at the Bucuti & Tara Beach Resort, Papillon Restaurant, Faro Blanco, Hadicurari, Dragonfly and The Chophouse, Omakase and Ike’s Bistro at Manchebo. Increased demand has also made it easier to source ingredients, from vegan sausages to ice creams. Almond milk and soy milk are now available at almost every coffee shop on the island. 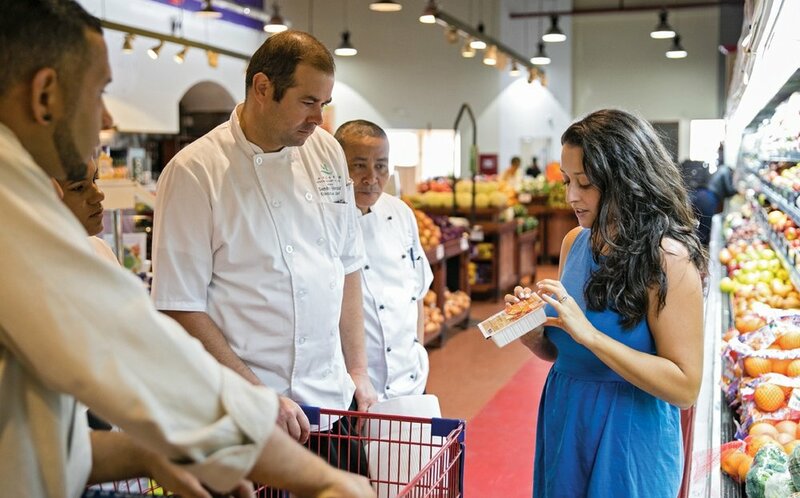 Since most of the island’s food is imported, though, local chefs have to consider cost. That organic vegan ranch dressing, soy-chicken cutlet or marinated jackfruit that Chef Herold’s excited about can be a huge restaurant expense. That’s why Marin offers tips like buying hydroponic lettuces and dragon fruit from a local producer. “Prices are better and the flavor is better,” she says. She also stresses the importance of checking ingredients for things like monodiglycerides, lard and sugars, which may contain animal products. “Most sugar is processed through bone char to whiten it. You might think brown sugar isn’t, but it’s actually refined sugar with molasses added,” says Marin as the chefs listen raptly. The same goes for icing sugar, but organic sugar or raw cane sugar are always vegan. Confusing? “If you have questions, just email me and I’ll let you know or I’ll contact the brand to ask,” she tells the chefs. Thanks to her, it’s never been easier – or more delicious – to eat vegan on Aruba. Feb 1 What’s in a Name?